As I wrote earlier, we were lined up for a shuttle that would take us up to Eielson Visitor Center. After a stop of about 30 minutes, the bus would return to the WAC. 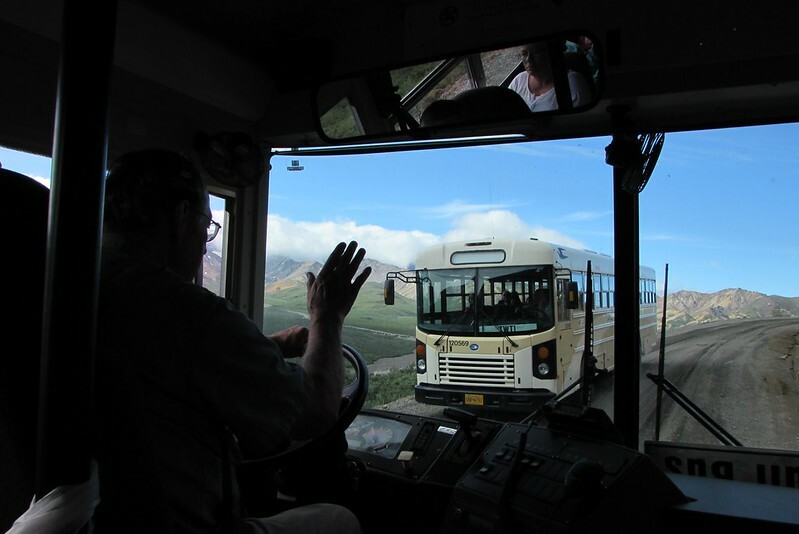 Visitors were free to a) stay at Eielson for 30 minutes, then return on the same bus, b) hang around at Eielson longer and take a later bus back, or c) should availability permit, take a different bus all the way up to the final stop – Kantishna. Kantishna is a location that has lodging facilities as well, though obviously, you would need to have reserved that way way in advance! Needless to say, it is pretty expensive as well. Because it was a relatively cloud free day, we thought we had a good chance of seeing the mountain, though I knew that if the clouds had settled in that direction, our chances would go down very quickly. High mountain peaks typically generate their own weather system, as we had learned to our detriment in Jungfrau, Switzerland, where we didn’t see the peak even once during our three days in the Lauterbrunnen valley. I had read elsewhere that though the shuttle bus drivers are not paid to provide any commentary beyond succinct Yes/No/ThankYou kinda comments, quite a few of them try to engage the visitors and keep them entertained. So, when Ken got started, he said that though we were in a shuttle and his job was to only take us to our destination, he would share his experience with us to make it a pleasant journey for all of us. Ken looked to me as being almost as old as my mother. And his commentary ratified my guess. Right at the beginning of the trip, Ken said that his bride and he had recently celebrated their 52nd wedding anniversary and that though he had been here a few years, he now planned to retire at the end of this season. He also added that he had been married when he was 22, and we could use our math skills to determine his age. His dream was to take his wife to Ireland for a few months, sometime in the future. An amusing take to Ken’s announcing his 52nd wedding anniversary: my mother who is not used to the American accent turned to me and said, he sure looks older than 52! We went by the official Visitor Center and the nearby dog kennels where the rangers raised dogs for use during the winter months. These dog sleds are one of the few means of transportation across the national park in the winter months. The huskies are raised as puppies and kept there in Denali until they are about nine years old, after which they were retired and released to folks who wish to adopt them. However, because of their body chemistry, these dogs are not given to folks in the lower part of the Lower 48. In other words, if you are from, say, Florida, Georgia, Alabama, etc, you would not be able to adopt these dogs as pets. Needless to say, he also added, not all puppies last the nine years. To be part of the sled team, the dogs need to have the right attitude and be willing to be team players. For more information, he said, the dog kennels are open throughout the day (in the summer months) and they even have demonstrations of the dog sleds three times a day – at 10 am, 2 pm (this I misremembered as 12 noon – *spoiler alert* this was a significant miss … for tomorrow) and 4 pm. Regardless, as I was climbing up with my mother, I noticed that the first row right behind – and to the right of – Ken was available and took it without a second thought. That turned out to be a good decision as my mother didn’t have to navigate through the bus to get down and get back in. And as she was always the first getting out, it didn’t really hinder the others (though maybe they were delayed by a few seconds). Of course, it was a great move from the view standpoint as well – in addition to the window to our right, we got both the front windows to look out form! The rest of the family took one of the rows toward the back of the bus. Presently, Ken slowed down the bus and said, “What you are going to see now is going to cost you! You are going to be part of the 30% Club. 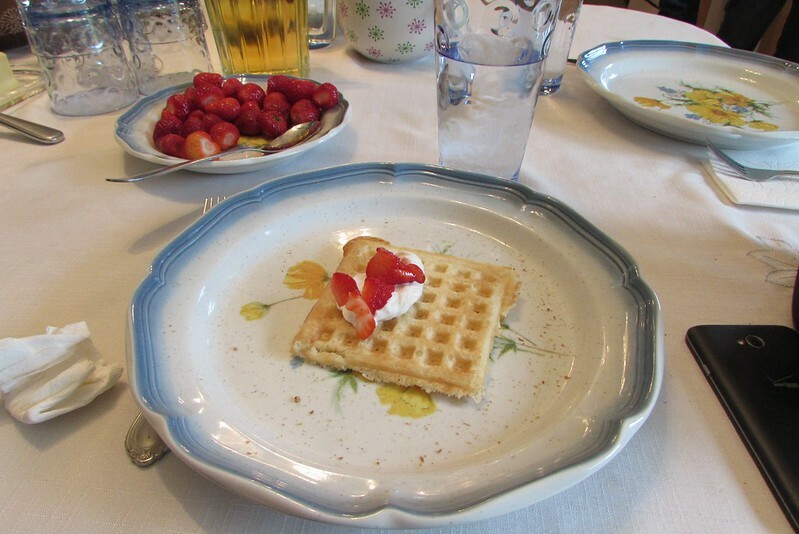 What is that? 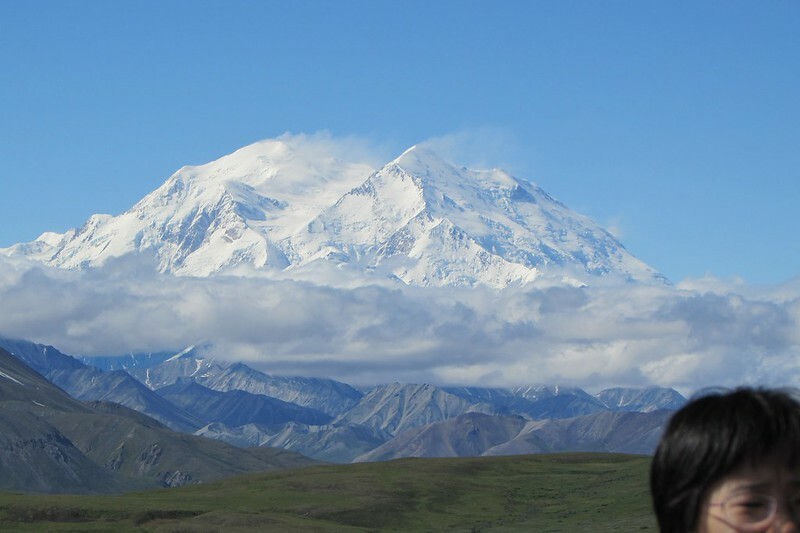 Well, look to the left – Denali has decided to reveal himself to you. Only about 30% of our visitors are able to see the mountain without clouds. You will now need to go back to the visitor center concession booth where my wife works, and purchase the souvenirs which state that you are part of this exclusive club.” Forty necks swivelled left and sure enough, there was the Great One! Hopefully, he would still be revealed when we got to Eielson, but there were no guarantees. So, we might as well take as many photos as we wanted! 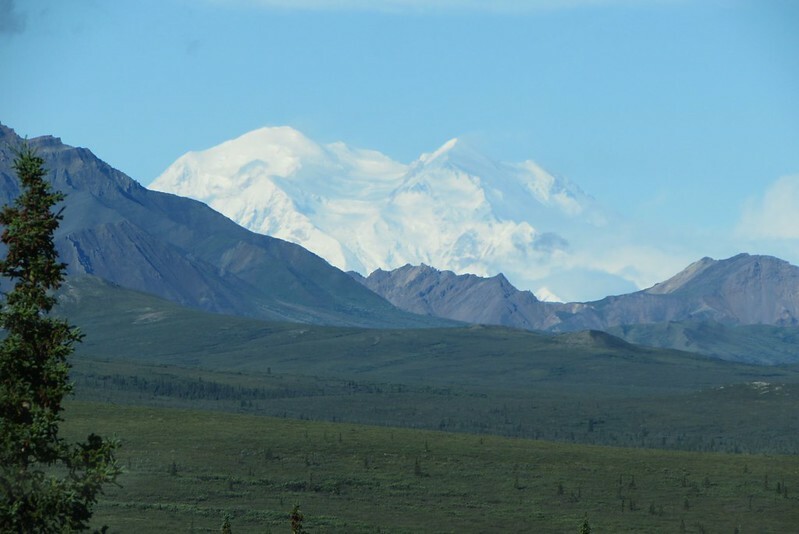 Though folks talk about Denali dominating the landscape, I didn’t get that impression – maybe I had overestimated the term “dominating!” Sure, he still towered above the closer mountains, but because of the distance – we were still about 60-70 miles away, it was difficult to grasp the true difference in height. 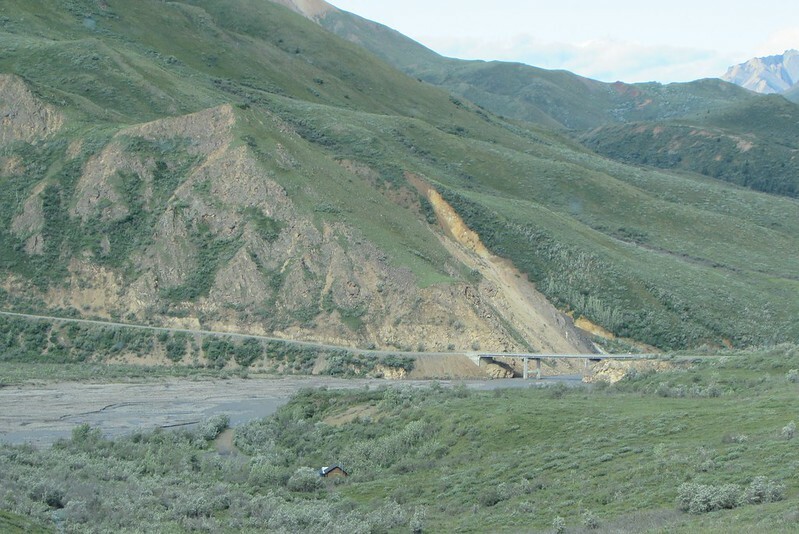 IIRC, this is the bridge over the Savage River – and tourist traffic cannot go past this point as there is a ranger station right by the bridge. The hut to the bottom left of this photo is one of the earlier huts in the park and is even to this day used by the rangers in the winter months. 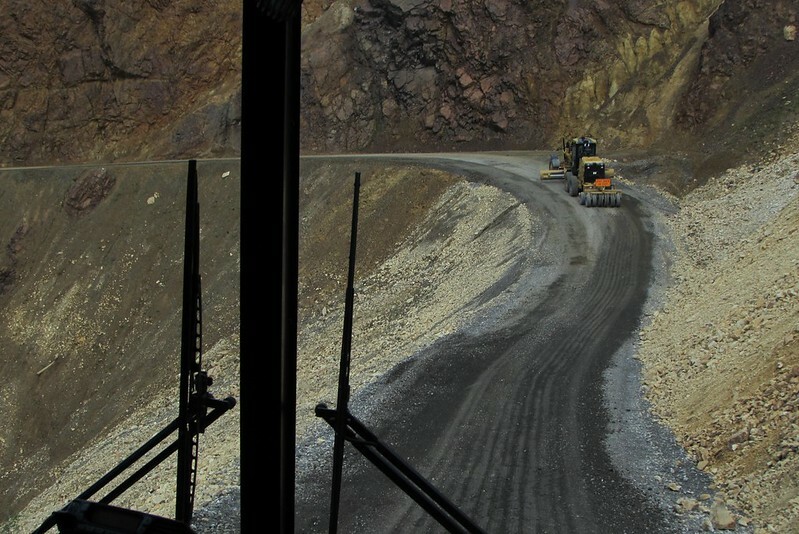 Ken gave a good humorous explanation of these areas of the roadway where there is a steep drop to one side. He talked about how he had come once with his entire clan – wife, kids, grandkids and great grandkids and how a couple of them were a bit scared on the way back. Here we cross one of the Tour buses – these are the ones that are customized air-conditioned (not sure) buses with narration. These do not pick up folks who are using only the shuttle bus system. 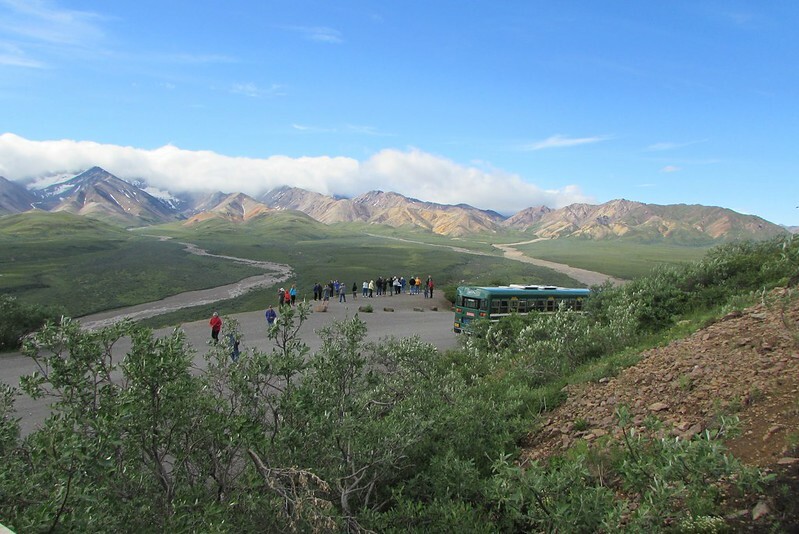 Our bus and co-passengers at one of the stops along the route – this is Polychrome overlook where you get to a lot of little hills that change color depending on how sunny, cloudy or rainy it is and the time of day as well. We didn’t notice a lot of variation in the colors during our travel, but if you google, you will notice a lot off color variation. Notice too, how the clouds are all ranging in that one direction. Had Denali been in that direction, he would’ve been hidden from us. Zoomed in, I just about got around all of the tourists! 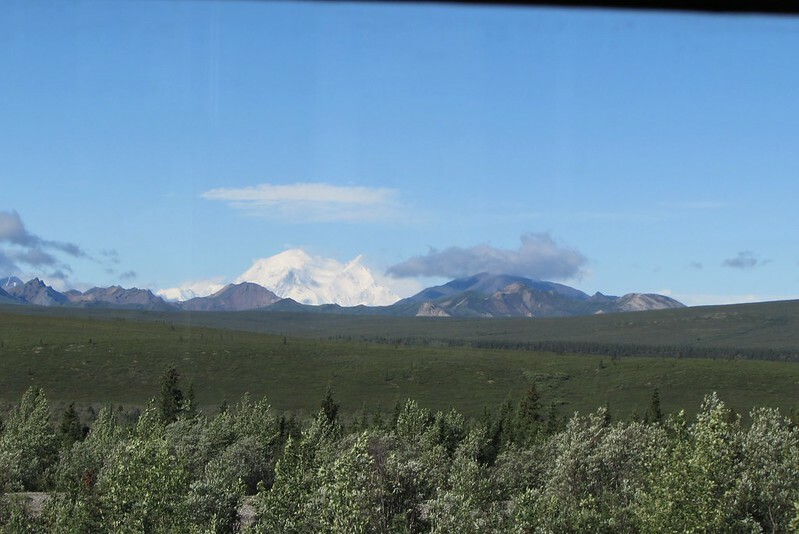 I got the feeling that Denali was sweating – as I recently learned, it is actually the snow blowing off the face of the mountain (so, I guess I am justified in making the statement that the mountain is sweating). 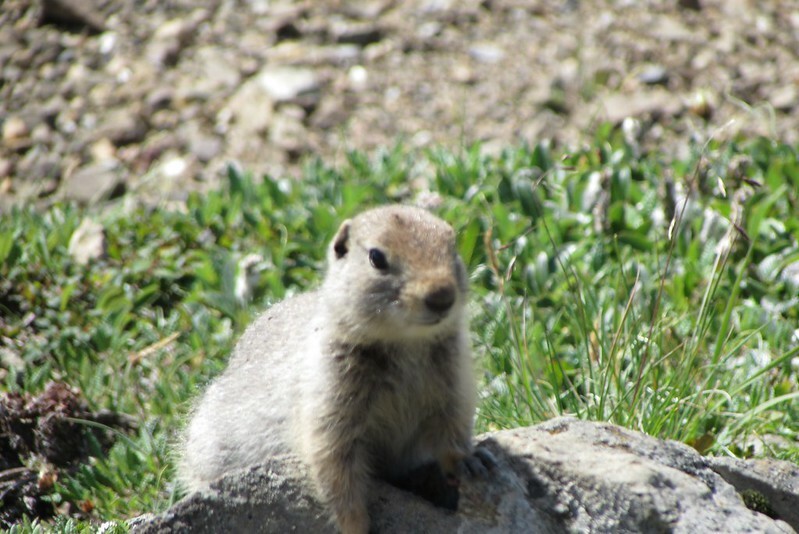 At Eielson Center, a ground squirrel at a Ranger-led walk that we went on. Some of the other tourists had gone hiking up the hill on one side of the visitor center – the other side led down. We were not too keen on hiking, so went with the ranger. That took a good hour. By this time, clouds had started forming and only the summit of Denali was clearly visible. 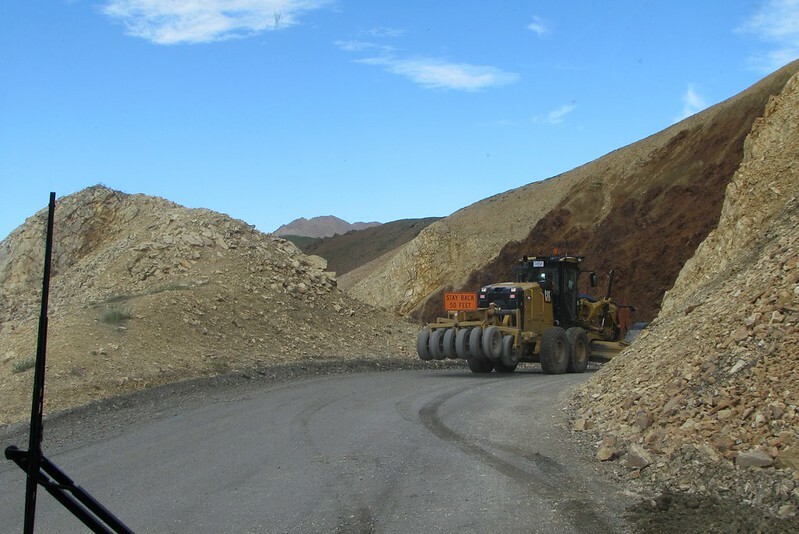 So, we knew that even if we were to go all the way to Wonder Lake, our opportunities of further sighting for that day was going to be severely limited. However, we decided that we might as well take advantage of the weather and travel further into the park. For tomorrow, we had a 11 am ticket and though we had an earlier ticket for the day after, we were not sure if we would be motivated enough (having already seen Denali) to wake up early and drive in from Talkeetna. 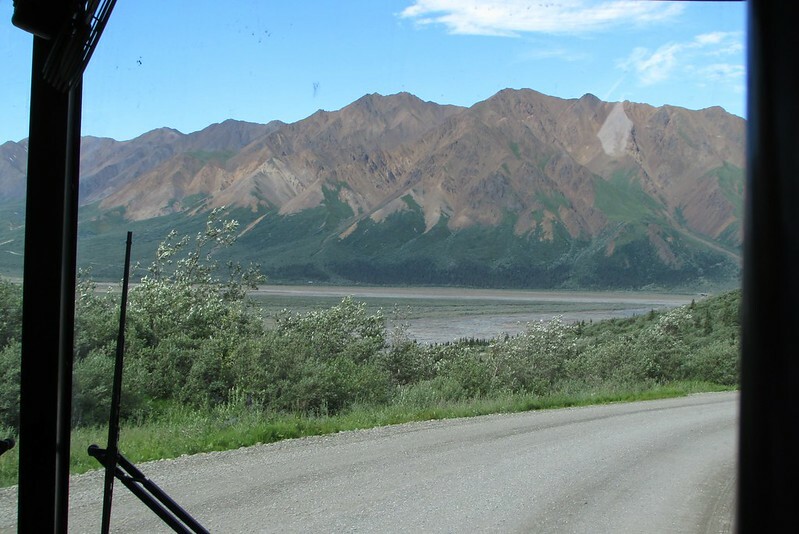 And neither of those possibilities would permit us to venture deeper into the park than Eielson. 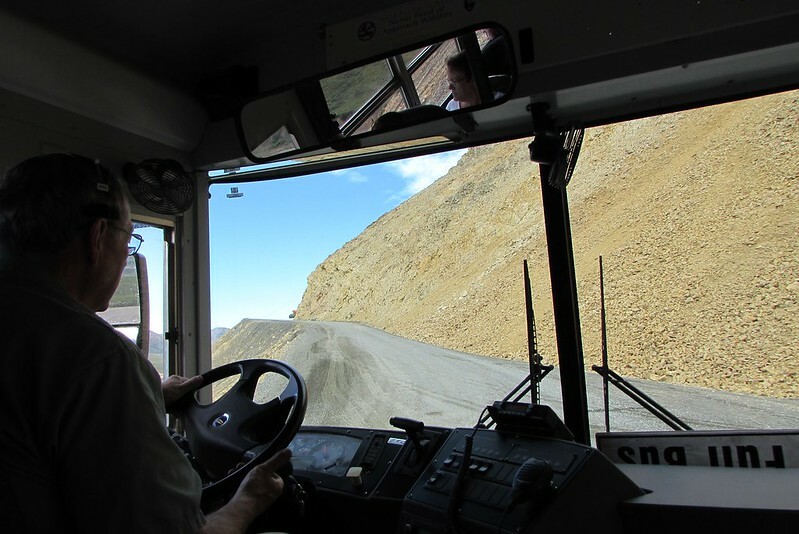 Therefore, we informed the local dispatcher that we would want to go all the way to Wonder Lake, and he said that the next bus would have space in it, but we would have to turn around back in it, as the bus after that might not have space to bring us back to the WAC. At Wonder Lake, there was the option to walk a mile or so each way to Reflection Pond and take a photo of Denali with a reflection. If we hurried, there would be sufficient time to do so and catch the same bus on its way back from Wonder Lake. However, clouds had taken over and – you guessed it, we had bears at the back of our minds, though we had not encountered a single one from the bus – so we decided against trying that hike. Wonder Lake had clouds around it and the water was also choppy, which is what the drivere had said would be the case at Reflection Pond as well, so in hindsight, not hiking to Reflection Pond was a good decision. Our second driver of the day (T.P.) was not as much fun as Ken. I cannot put my finger on one thing that I had a complaint about, well maybe it was that she was not as effusive in giving a commentary (but that could also have been because we were on our way back now and a) everyone was tired, and b) most probably had heard it on the way in). Be that as it may, she did stop at Eielsen where we got out to fill water and admire the scenery (at this point, Denali was no longer visible and we were even wondering if it would rain on us). 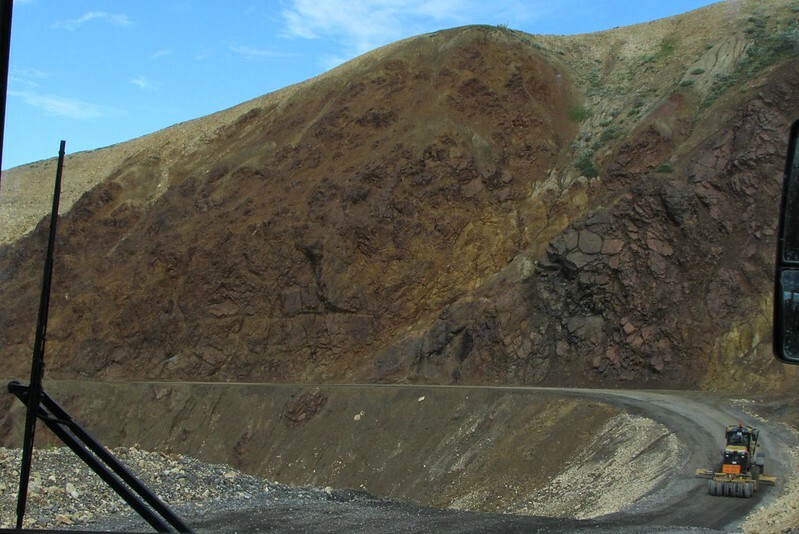 We stopped at the Polychrome Overlook for photos, but the grizzly bear eluded us yet again. The folks on the bus – inbound – had apparently spotted a mom and calf but it had been very far away. We – well, to be precise, the other passengers who had industrial strength binoculars – tried to spot them to no avail. We even had a couple of false alarms, but nothind doing – we did see some owls right by the roadside. Nearing the WAC, it was past eight pm, and our driver slowed down to point out the Riley Creek trestle (railroad) bridge. Many of our co-passengers took photos; Courteous Ken From Kentucky had not pointed this out to us (probably because it was behind us on our way out). I made a note to check it out further tomorrow or the day after, should we get a chance. 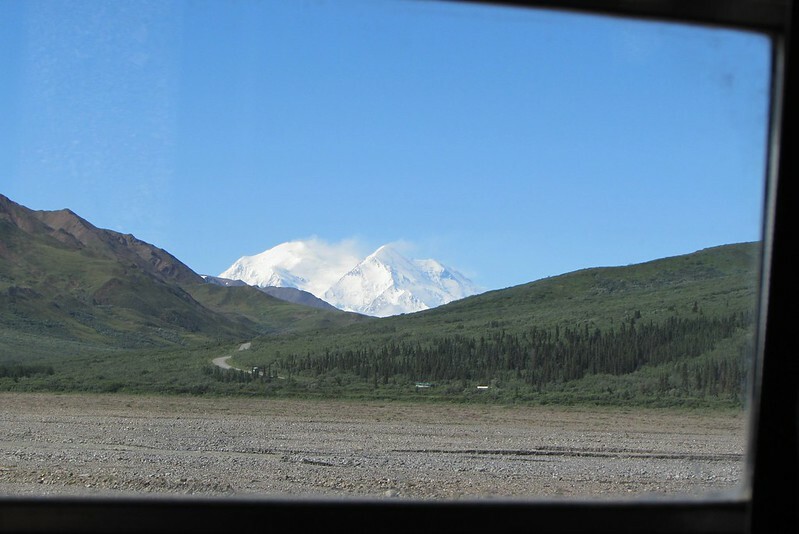 Given that it was really late now (past nine pm) when we finally got back – tired – to our cabins, that we had already seen Denali and that the weather was not expected to be as good the next two days, we revised our plans for the next two days.